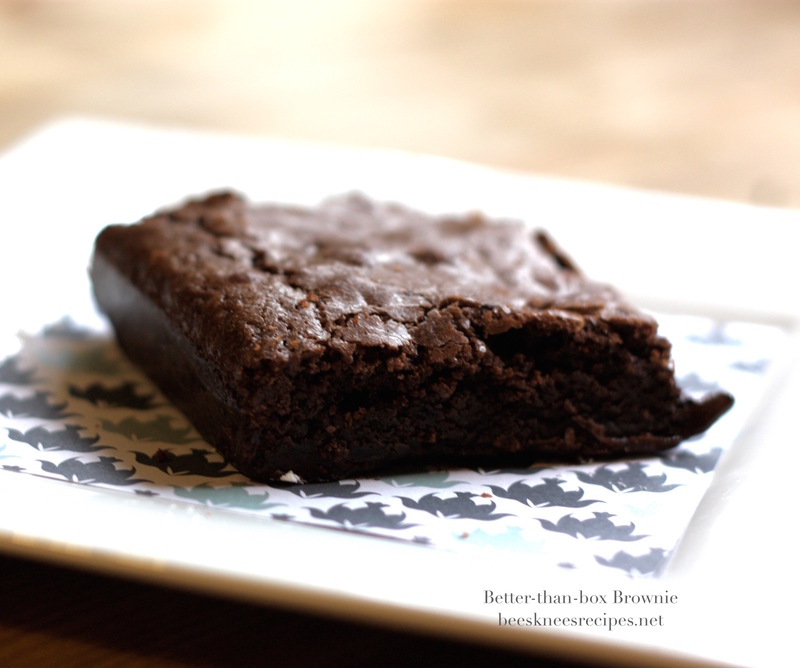 This is the recipe I referenced under the Baked Brownie. I was pleased to see that ATK acknowledged that there IS something to a box brownie mix, especially Ghirardelli’s. In order to recreate the chewy texture, Andrea Geary at ATK created this recipe (published in the Best of ATK 2011 Annual), and as I mentioned before, it gets high marks (my oldest son tonight told me that if there was the best brownie restaurant in the whole world, and he was eating there, this brownie would still be better. I would like to go to that best brownie restaurant in the world. Sounds like heaven). You may have the shock I did when I saw how much sugar goes into it, but I guess the sugar is, in part, what makes the brownie so distinctive and so much like a box! 1. Adjust an oven rack to the lowest position and heat the oven to 350 degrees. Line a 13 x 9 inch baking dish with a foil sling, lightly coat with vegetable oil spray, and set aside (I use Reynold’s nonstick aluminum foil and I love it). 2. Whisk the cocoa powder, espresso powder (if using), and boiling water together in a large bowl until smooth. Add the unsweetened chocolate and whisk until the chocolate is melted. Whisk in the melted butter and oil. (The mixture may look curdled.) Add the eggs, yolks, and vanilla and continue to whisk until smooth and homogeneous. Whisk in the sugar until fully incorporated. Add the flour and salt and mix with a rubber spatula until combined. Fold in the bittersweet chocolate pieces. 3. Scrape the batter into the prepared pan and bake until a toothpick inserted halfway between the edge and center comes out with just a few moist crumbs attached, 30-35 minutes. Transfer the pan to a wire rack and cool for 1 1/2 hours.